Up until now I have mostly focused hardware reviews (PDA devices) around the Palm brand. As you probably know Handspring recently released the Visor Edge, in preparation for that review, and to kind of kick off some forthcoming series of Handspring reviews, Handspring has loaned Palm Infocenter a Visor Platinum for review. The Handspring Visor Platinum is a silver streaking machine. It's an all silver (except for the screen cover and stylus unfortunately) Visor Deluxe on steroids. 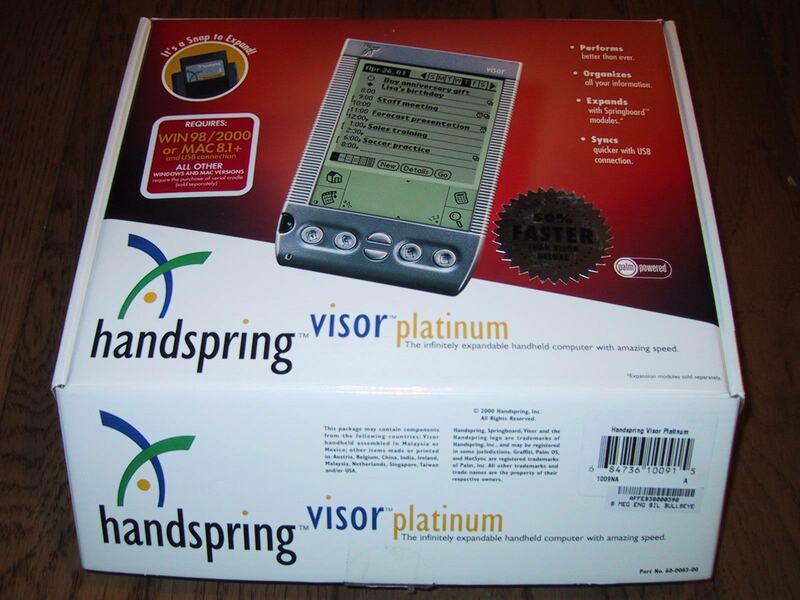 This upgraded Handspring device is running PalmOS 3.5.2.H on a 33 MHz Dragonball processor. The items above are essentially the only difference between the Platinum and the Visor Deluxe, but boy do they make for a much nicer user experience. Handspring claims the Platinum is 50% faster than the Visor Deluxe. 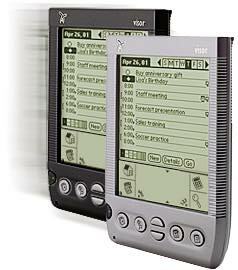 Now with Palm OS 3.5.2H, the Visor comes into the latest OS arena. I'm glad to be away from OS 3.1 - of course if there were Flash ROM this wouldn't be an issue since upgrades would be possible (yes, minor updates are possible - patches, but not major OS versions). The IR HotSyncing is a welcome addition as well as the OS 3.5 task bar items. Of course 8Meg is still standard. If you upgrade from a Visor Deluxe, and I suggest you do if you still haven't found a use for color, you WILL find a use for the Platinum's added speed. Some applications; however, check that your current applications will run under PalmOS 3.5. Fortunately, thanks to the SpringBoard "standard" most modules should work just fine, although again some modules' software may need upgrading for PalmOS 3.5. And, while you're looking for software updates, get some 4-bit grayscale apps while you're at it; it's not color but sure looks nice. Above are screen grabs of the "Enhanced Datebook" and "Advanced Calculator"
Why would you pay 100$ for speed? RE: Why would you pay 100$ for speed? is software selectable, thus you can set it for as high as 45 MHz if you really want to. I agree with the above post that for most Palm OS programs, clock speed is highly irrelevent. 5 seconds to almost instant. That to me is all the speed I need for now. They should get rid of the deluxe and drop the price of the Platinum to $249.00. Afterburner 3.0 can be used to reliably overclock older Palms to run as fast as the Platinum. Now, if they release a new afterburner, the platinum can be clocked even higher than 45. That's the idea. Finally, Liberty that plays at full speed!!!!!! i have a vdx, and was wondering if i should upgrade to the platuinm. i know that i looks better but is it really worth the money. or should i just save to get the next color handspring (no palms for me). is the screen that much better then the vdx and does speed make any differnece? I've tried the Platinum & you would really like how fast “ordinary” apps become. A $50 premium made sense, with some over-clocking utils costing $30, but I would hesitate paying $100. The review didn't mention that OmniSky runs on the Platinum & Prism but not on the Delux. The reason, says OmniSky, is an RF interference problem on the Delux & the original Visor. Also, you may be able to upgrade a Delux from OS3.1 to 3.2. Palm's upgrade runs as an app in RAM, it does not load into flash ROM. Which means you must reinstall it if you have a hard reset. I use 3.1 in my TRGpro & 3.2 in my Platinum & so far have not noticed any differences. The only thing I don't like about the Platinum is that the silver color is painted on. I've had my Platinum for about three months and the paint is wearing off on some edges, revealing a gray plastic case under it. I know I have had to make Handspring replace mine because of the paint.